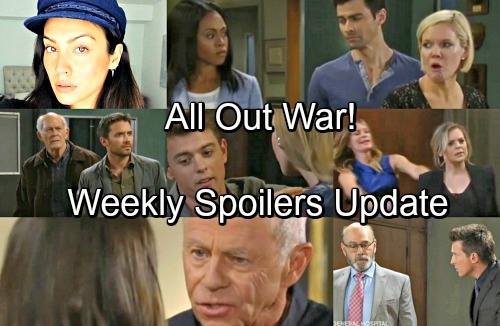 General Hospital (GH) spoilers update for the week of April 23-27 tease that the drama will rev up. First, Robert (Tristan Rogers) will force Anna (Finola Hughes) to confess that she’s Heinrik’s mother. Jason (Steve Burton), Sam (Kelly Monaco) and Spinelli (Bradford Anderson) will also wrap up the remainder of their bank quest. They’ll walk away with a hunch that’ll lead them to Valentin (James Patrick Stuart). Meanwhile, Oscar (Garren Stitt) and Drew (Billy Miller) will set some plans. They’ve been getting to know each other better, so they’ll want to build on that. GH spoilers say Oscar will remain hopeful about his parents getting back together. It looks like he may attempt to nudge them toward each other. Elsewhere, Jordan (Vinessa Antoine) is in for a shock. Curtis (Donnell Turner) will propose soon and this week’s info certainly points to that. Jordan will get a big surprise from Curtis, but she’ll have to wonder where it’s coming from. It seems Curtis will pop the question, so expect Jordan to grill him about the timing and his motives. Other General Hospital spoilers say Nina’s (Michelle Stafford) scheme will flop. She’ll arrange a date for Peter (Wes Ramsey) and a model named Rachel Goulding, but they won’t hit it off. Furthermore, a livid Maxie will stick to Peter like glue after this. She’ll want to protect him from Nina’s drama. While Peter and Maxie strengthen their bond, Ava (Maura West) will set up a meeting with Scott (Kin Shriner). She’ll be prepared for a bitter custody battle, but Griffin (Matt Cohen) will advise against it. They’ll have an intense argument, but Ava will feel like this is something she has to do. Sonny (Maurice Benard) and Carly (Laura Wright) will also meet with Diane (Carolyn Henessy) to discuss what’s ahead. They’ll hope she can help them beat Ava in court. Nelle (Chloe Lanier) will offer Ava some guidance, but will it be useful or manipulative? Maybe it’ll be a little of both! Finally, Kevin (Jon Lindstrom) will assess Carly’s mental state. He may be concerned once he hears her whole crazy story. General Hospital spoilers state that Nelle won’t let up, so Carly’s going to look like she’s gone off the deep end soon enough. GH will deliver some terrific episodes this week. We’ll give you updates as other news emerges. Stay tuned to the ABC soap and don’t forget to check CDL often for the latest General Hospital spoilers, updates and news.